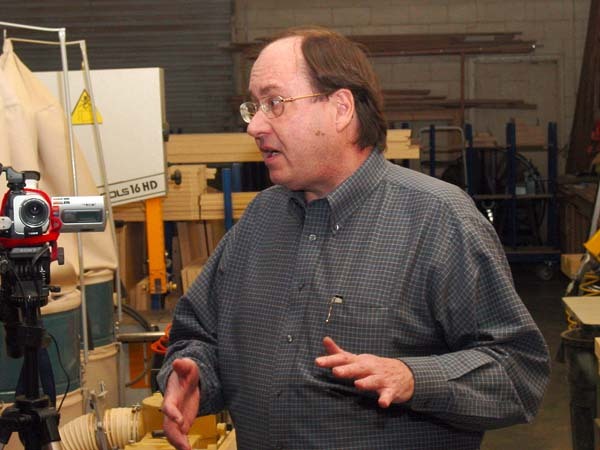 Our new President Bruce Berger began the meeting by announcing the news that all of the details for holding our Hands-On-Sessions at the Oxnard High School Woodshop have been ironed out thanks to the instructor Chad Meyring and the school principal. 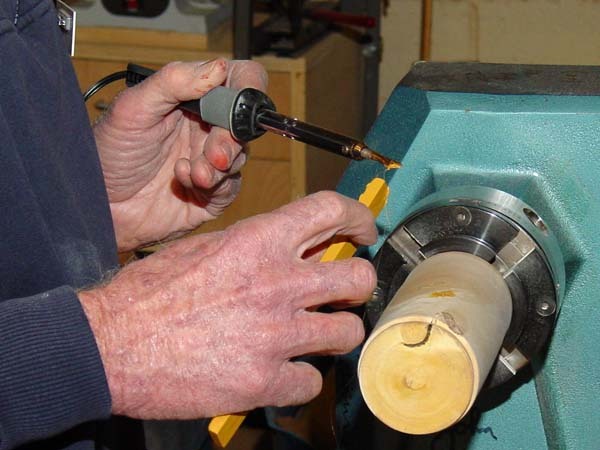 There are 6 lathes in the shop and room for us to bring our small lathes if we choose to in the future. As noted above in blue our agreement with the school and due to the AAW insurance policy that covers our activities only current members of the AAW will be allowed to use the lathes. 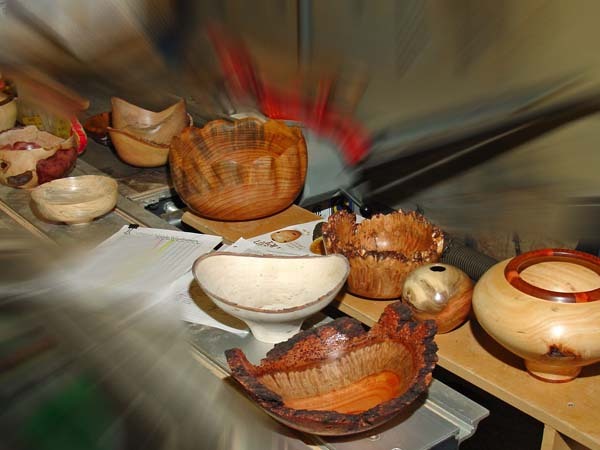 We strongly suggest that all members of Channel Islands Woodturners join the AAW anyway for the many benefits including the excellent quarterly journal and the annual symposium. 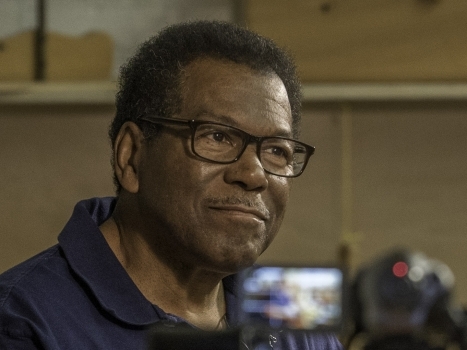 Non-AAW members are encouraged to attend and learn by watching. 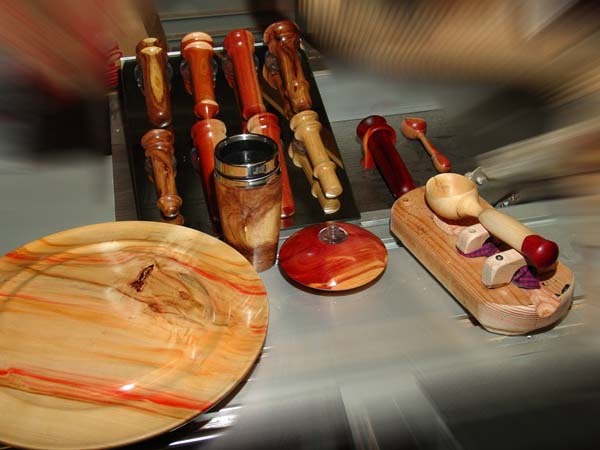 If you don’t have a lathe and are just considering whether to pursue this hobby, we will link you up with one of our mentors and you can practice in their shop. Also see the mentor info on the officers page. 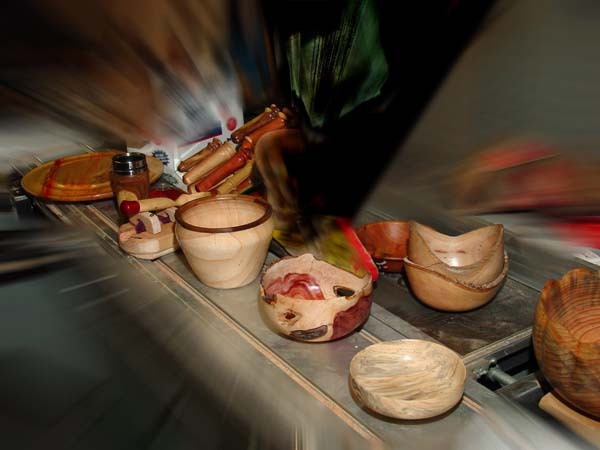 For the first shop meeting in February remember to bring not only your safety gear but also wood to turn, sandpaper, superglue, your turning tools (sharpened) and any finishes that you might want to use. The meeting will end at 1 pm with the last 20 minutes committed to cleaning up the shop (if you turn you clean!) Also we will not be providing drinks, snacks or lunch so it is BYO. 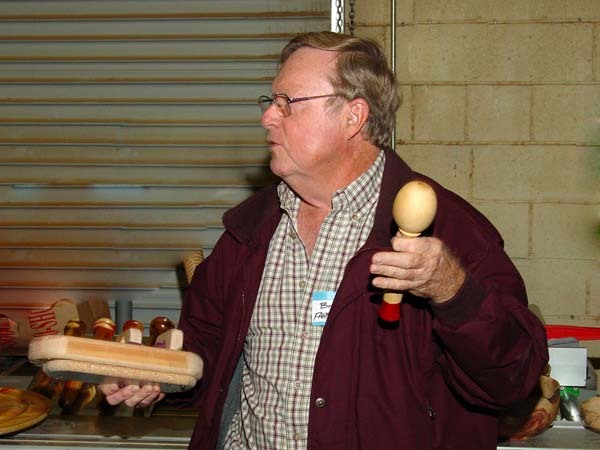 Bruce reminded us that the avocado wood that Tim Albers has been bringing us in the fall and spring also brings an obligation on our part to give him simple, small bowls (natural edge or otherwise) to give to his avocado suppliers. 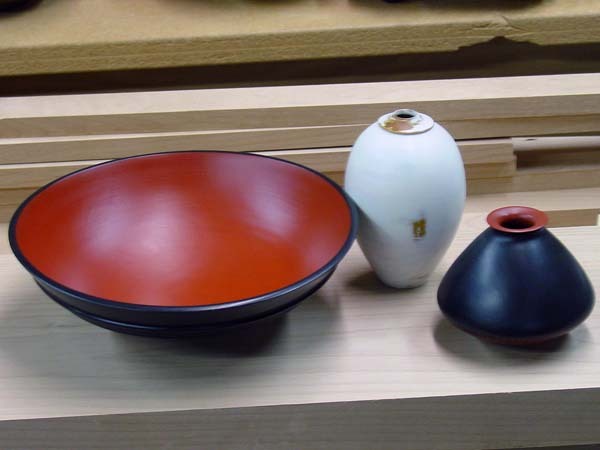 We have been remiss this year and not produced as many as usual; so if you took wood bring back a bowl. 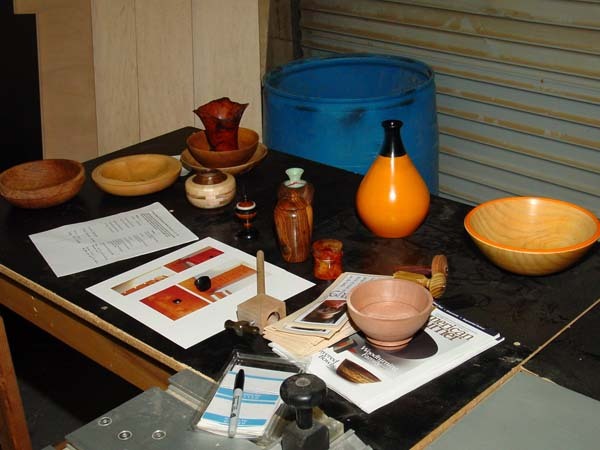 See the April 2004 newsletter for photos of the first year we started this. 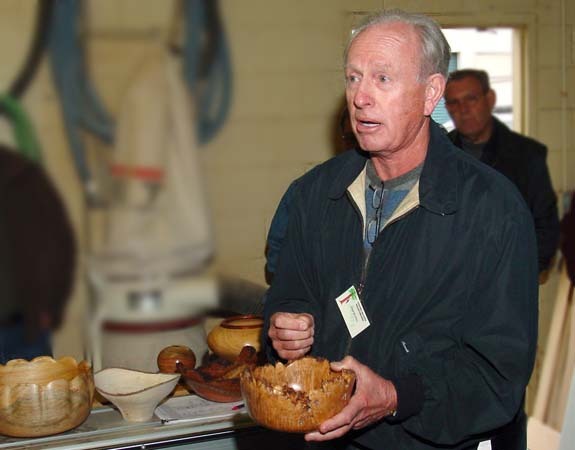 Also see Warren Brown and Jim Rinde’s article in the AAW Journal in the Fall 2004 issue page 42 on the Avocado Bowl Project. The group then ratified the executive board’s recommendation that the fees for the all-day demonstrations by professional turners would be increased to $35 for club members and $45 for non-members. Since this includes lunch it is still a bargain and our costs have increased. 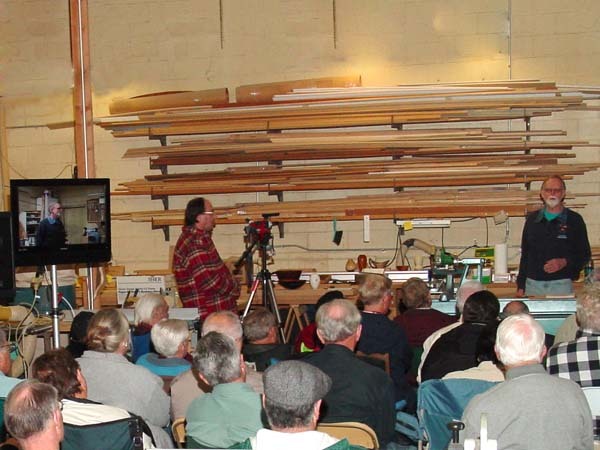 Note in the photos below our new TV monitor, and we have plans to continue to upgrade our video and sound equipment. The membership fee to join the club will remain at $25; unchanged for the past 10+ years. We also decided to contribute $200 (for the remainder of this year) to a scholarship fund for the kids in the Cabrillo Middle School woodshop who may be unable to afford the cost of wood for their projects. The cost for wood ranges from $25-$75 depending upon the project but even this amount is a problem for some kids. This will be done through the Parent Teachers Organization at the school and the instructor Mr. Radley will handle the actual details. 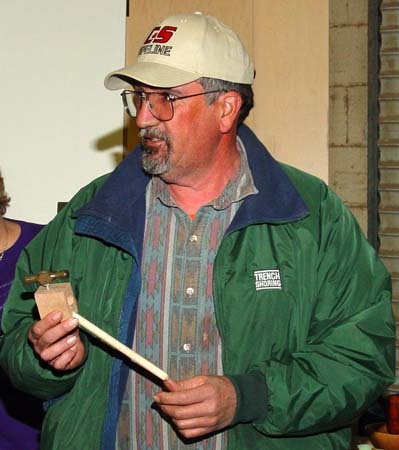 It just so happens that our Trebuchet from the 2003 AAW Symposium collaborative challenge was sold at the Edward Dean Museum. We had hoped to fetch more but it sold for $300 and our proceeds were only $180. We decided that this would go directly to the PTO at Cabrillo Middle School as the startup funding. We hope that by September 2007 when school starts up again we can contribute a more substantial amount. See the photos at the bottom of the page in the March 2006 newsletter for our mentoring program at Cabrillo. 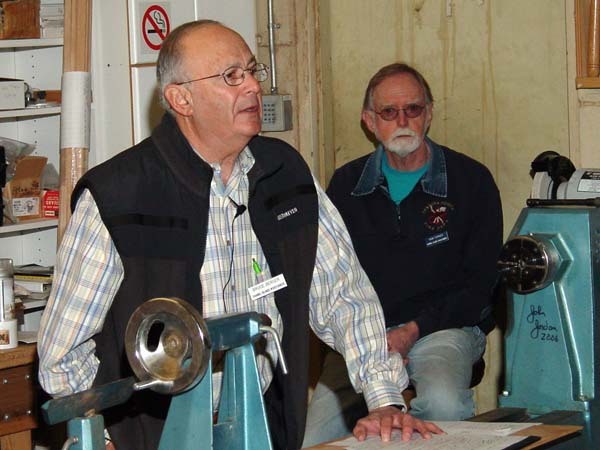 After an excellent Show-N-Tell session, member Sam Tuner presented a discussion on sanding and finishing your turning. These are described in the photos and captions put together by Ron Lindsay. 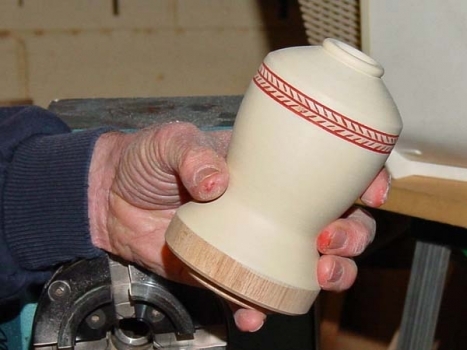 Sam made a point of stressing sanding to a grit of 600 (if you are aiming for a smooth finish). Unlike cabinet work, a turned bowl has end grain in addition to side grain so a finer degree of sanding is often needed to remove scratches since we are sanding across the grain on two sides of the bowl! Many of last year’s members have now rejoined. 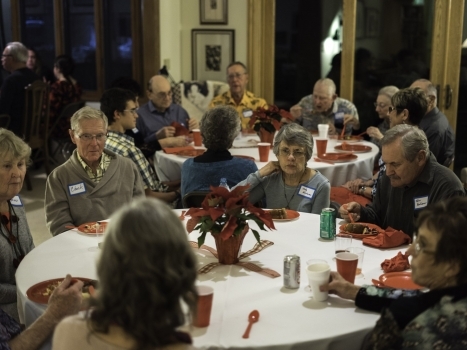 After the Feb. meeting a list of of current members with contact information will be emailed directly to the members only. If you haven’t renewed or plan to join plan on doing so by then. Also note that photos of Bob Pettit’s work has been added to the Gallery. 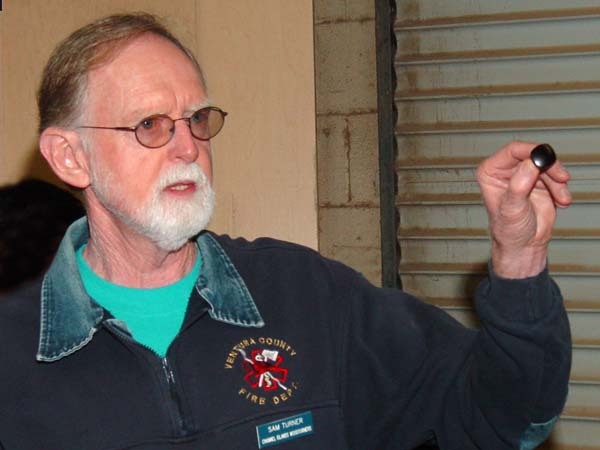 New president Bruce Berger explained new venue for Hands-on sessions at Oxnard High School. Russ Babbitt discussed library policies. These are posted on the Library page. 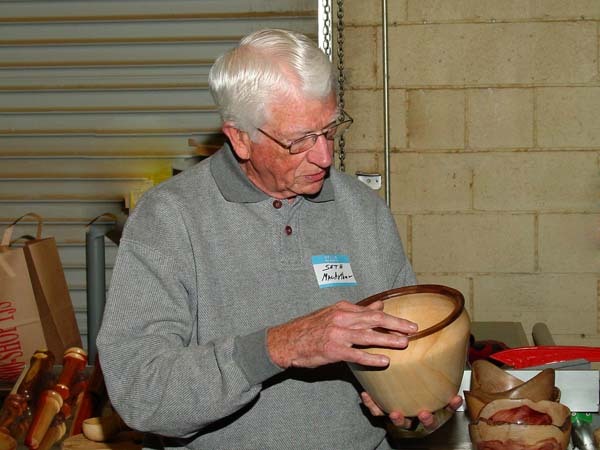 Visitor with Ironbark Eucalyptus natural edge bowl kicks off Show-n-Tell session. 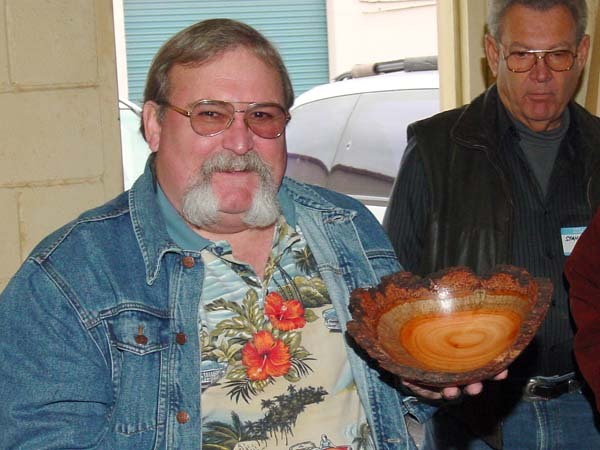 Alan Kirkby with maple burl bowl. 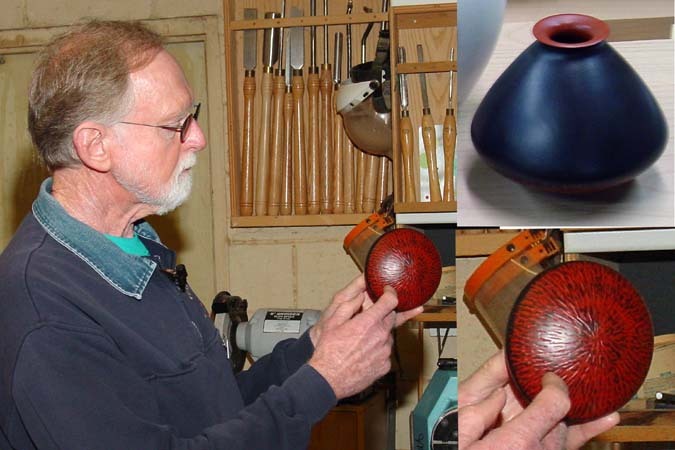 Jim Word contributed Avocado bowls for Tim Albers. Seth MacArthur tried Warren Brown’s segmentation method. 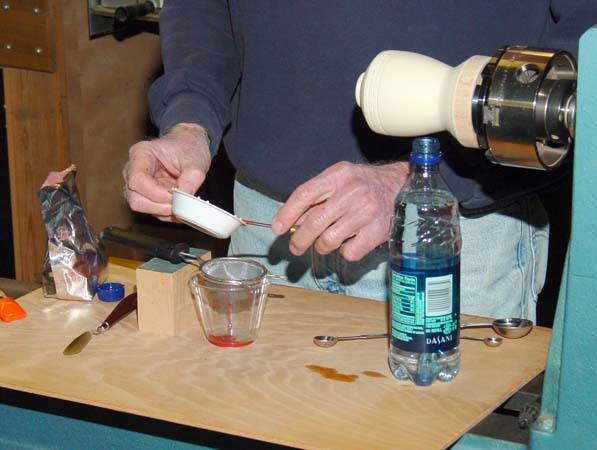 Bob Fahrnbruch built this holding jig for hollowing the scoop. 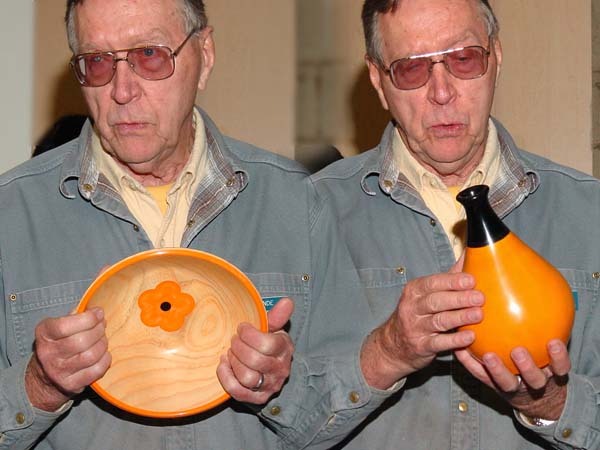 Dave Staeheli with bud vases. Suction cups attach them to windows. 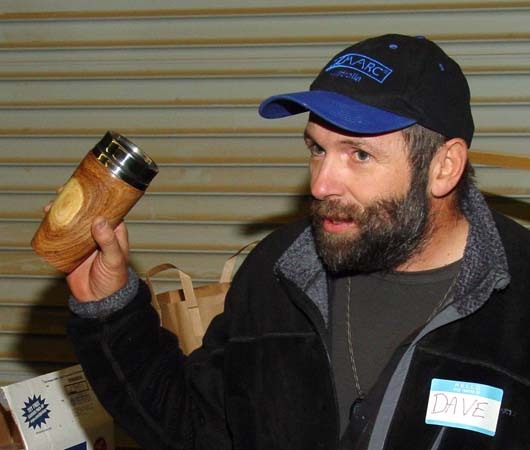 Dave again with coffee mug. Stainless insert is available. 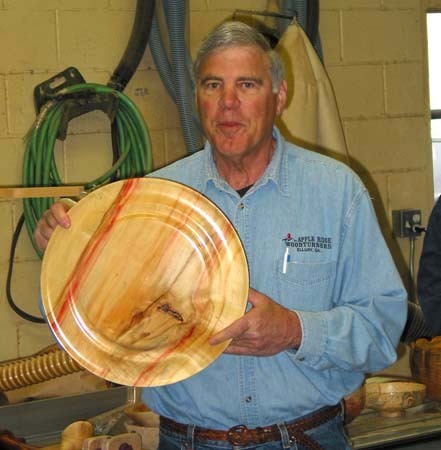 Tom Beacher with Box Elder platter. 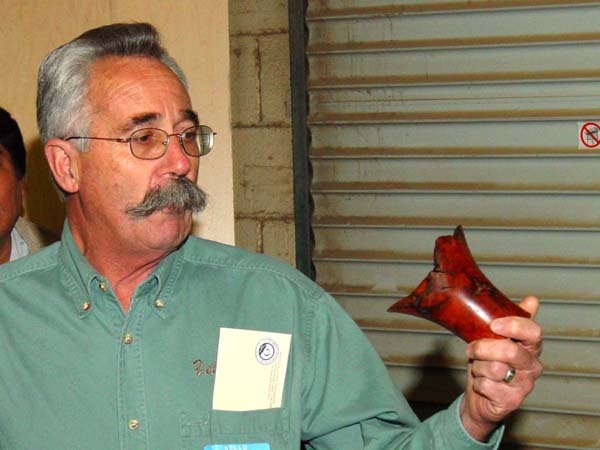 Steve describes adventure with Manzanita burl. Crowd aghast over Joel Oksner’s high flying Oak bowl. Gary Toro made his own grinding jig. 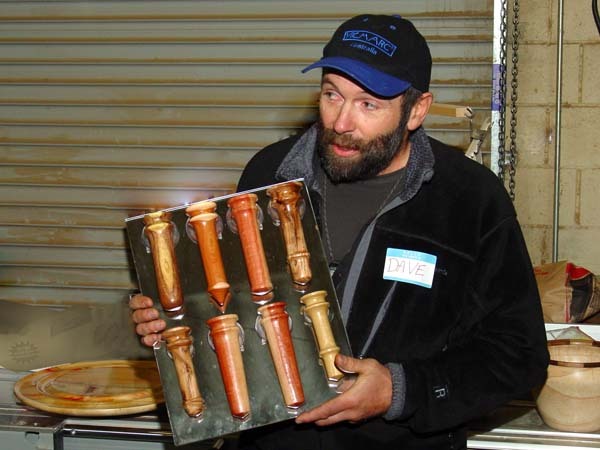 Jim Rinde with two more epoxy creations. 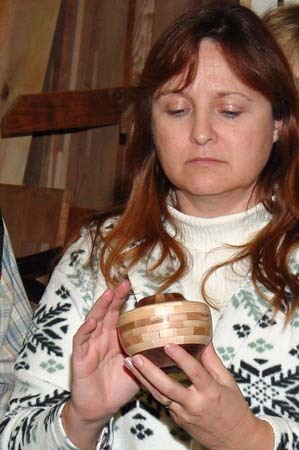 Denise Lyons admires Chuck Stevenson’s first segmented hollow form. 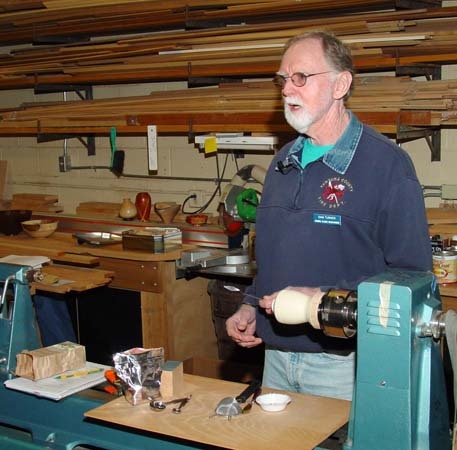 Sam Turner made a set of ten Ebony knobs the hard way – eccentric turning. Show-n-Tell Table – Part 1. Show-n-Tell Table – Part 2. 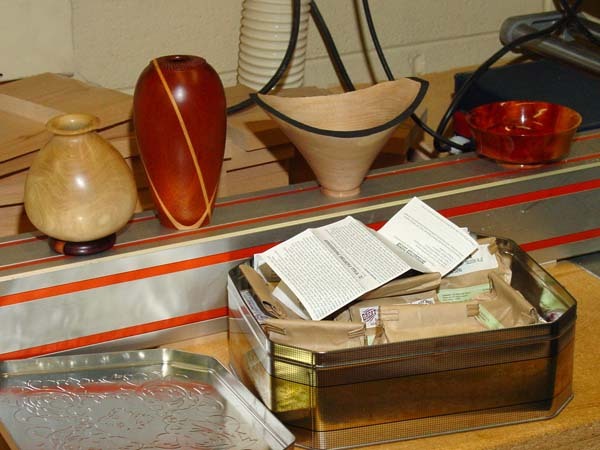 Show-n-Tell Table – Part 3. Show-n-Tell Table – Part 4. 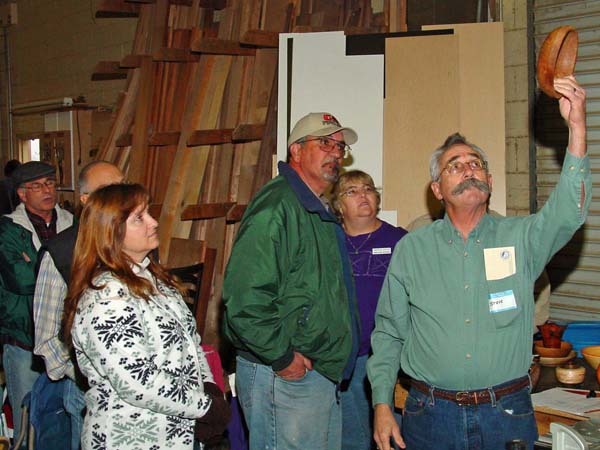 Sam Turner is featured speaker discussing finishes and finishing methods. Milk paint is his specialty. Bowl bottom decorated with red and black milk paint and carved texturing. Sanding off the top black coat reveals the red in the carving. Sam is first to demonstrate using our new flat screen TV. Three projects utilizing milk paint. Walnut bowl rescued from cracks and breakage. 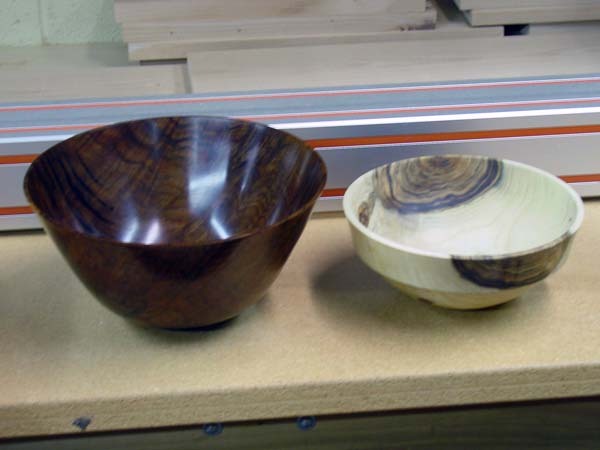 Pecan bowl has unusually thick sapwood. 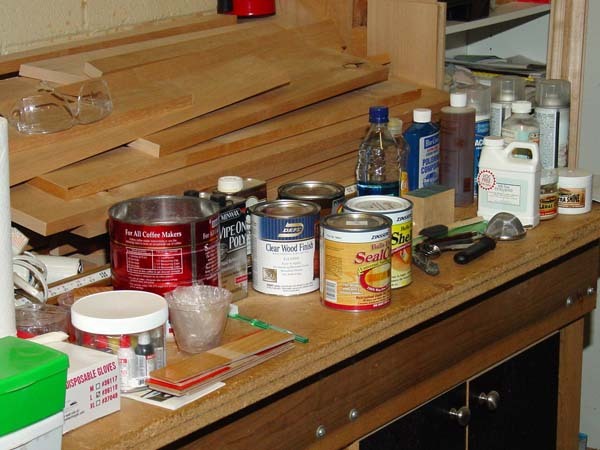 More projects and Sam’s dry milk paint stash. Natural edge with bark removed is enhanced with milk paint which is then sanded when dry, leaving the color in the hollows. Sam mixing red milk paint. It will last for a day or two if chilled but mix just what you need. 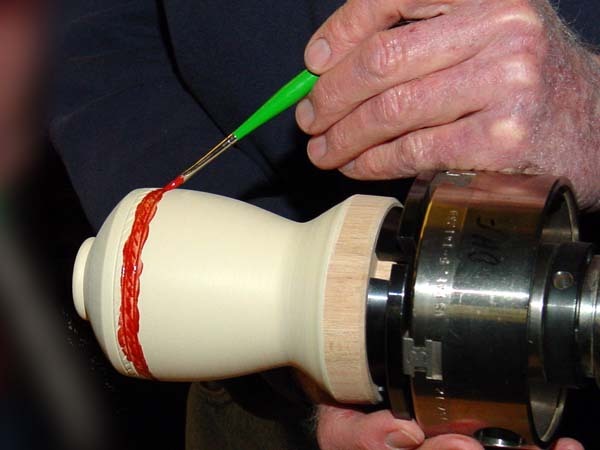 Applying the red paint to fill the carved decoration. The milk paint dries in about 30 minutes and more than one layer may be needed or layers of different colors can be apllied. Final effect with the excess sanded off. 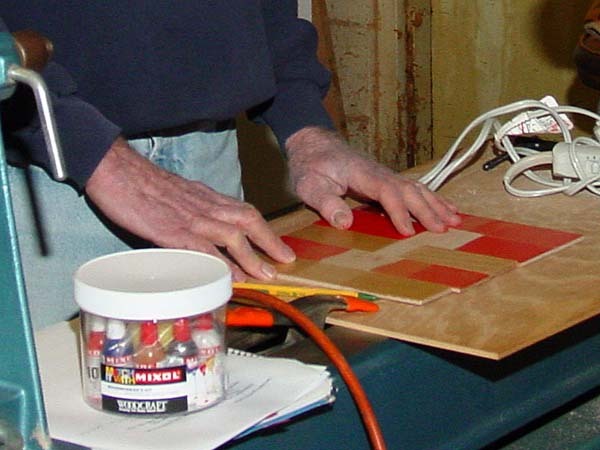 Applying colored lacquer stick with soldering iron to fill a defect in the wood. This would only be used as a final step prior to a final finish coat, not to strengthen the wood.